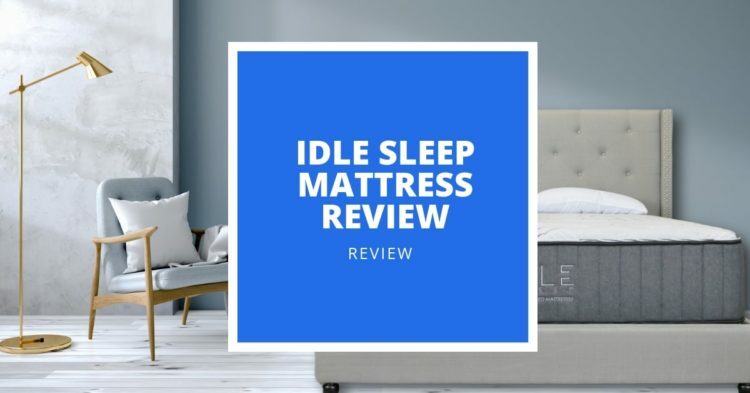 IDLE Sleep Mattress - 2019 Review: Is This Two-Sided Mattress Worth It? Idle Sleep make a range of flippable hybrid mattresses to suit a wide variety of sleepers. While not the cheapest beds on the market, they offer excellent value for their features and quality of materials. Is there one that will suit you? Keep reading to find out. The Idle 14-inch Double-sided Hybrid mattress is the company's best selling model, constructed from a pocketed spring system and foam. This mattress is described as ‘the best of both worlds’, offering the cooling and pressure relief benefits of foam with the premium support of pocketed coils. 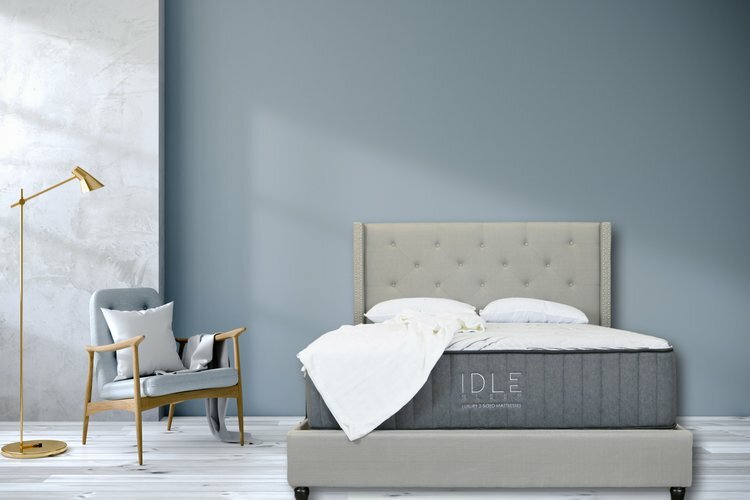 IDLE Sleep offers four different options in their range of mattresses: the Hybrid (their bestselling bed), the Latex Hybrid, the All Foam, and the Dual Feel. Using an innovative two-sided design, these mattresses boast superior pressure relief and cooling, while promising a longer life than most traditional foam or hybrid mattresses – with a lifetime warranty to back it all up. Keep reading to find out more about what makes them so great and which one is best for you. IDLE Sleep entered the mattress market with one main aim: to bring two-sided, flippable mattresses back into the mainstream because they last longer than one-sided mattresses that they claim use cheaper materials and charge more money. From their IDLE Cooling Buoyancy foam, which they say offers up to four times better pressure relief than memory foam and a cooler sleep surface, to their Thermocool™ fabric cover for enhanced temperature regulation, IDLE use innovative features to create high-quality mattresses that are built with comfort and longevity in mind. Available in two firmness options, the IDLE Sleep mattresses have some impressive features that offer great value for money. You want a mattress built to last: IDLE Sleep mattresses are double-sided to maximise the lifespan of every mattress. You tend to sleep hot: IDLE uses foam made with no viscoelastic chemicals and a Thermocool™ fabric cover, designed to provide a sleep surface that keeps you cool when hot and warm when cold. You want pressure relief: The brand claims that their Cooling Buoyancy Foam featured in the All Foam and Dual Feel mattresses provides up to four times more pressure relief than memory foam or latex. You want a guarantee with your purchase: IDLE Sleep mattresses come with a lifetime warranty, so you know that when you buy one of these mattresses, you’re getting it from a brand that has total faith in its quality. IDLE offer four different mattresses in their range: the Hybrid, the Latex Hybrid, the All Foam, and the Dual Feel. Each model offers a number of benefits that will suit different sleep preferences and needs. Below, we’ve outlined the key features of each model and their construction. 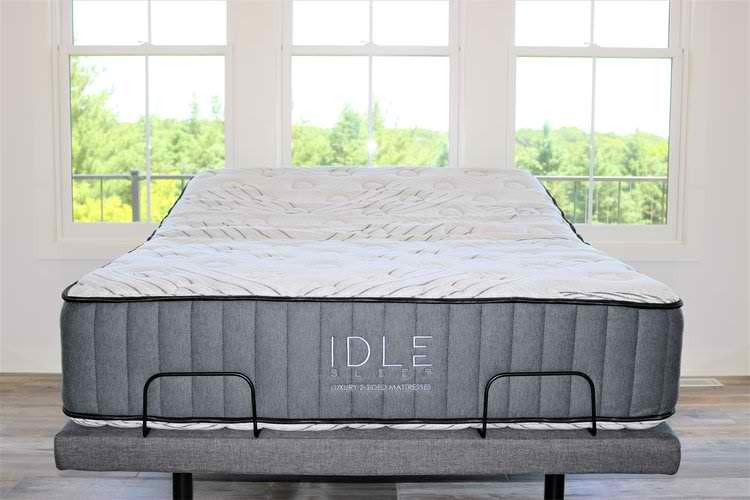 The Idle 14-inch Double-sided Hybrid mattress is their best selling model, constructed from a pocketed spring system and foam. The 14-inch Double-sided Hybrid mattress is described as ‘the best of both worlds’, offering the cooling and pressure relief benefits of foam with the premium support of pocketed coils. This mattress has a little more bounce than the all-foam option from IDLE, so it is perfect for anyone who dislikes the hugging sensation of an all foam mattress. The Hybrid model is available in both Medium and Luxury Firm. The Medium firmness option is rated as a 6-7 on a firmness scale of 1-10, while the Luxury Firm is rated at a 9-9.5. The Medium option is ideal for combination sleepers (those who switch between sleeping on their back, front, and side), while the Luxury Firm is more suited to front and back sleepers who prefer a firmer sleep surface. Plus-size sleepers may also find the firm provides less sinkage than the softer option. The 14″ IDLE Double-sided Latex Hybrid model has some natural materials and uses Talalay latex and organic cotton to provide a more eco-friendly option with added bounce. The Pure Gel infused Talalay latex layer is aerated and open-celled for added breathability, while the infused gel is designed to provide an even cooler sleep. In addition, the latex is naturally antimicrobial and hypoallergenic, allowing you to breathe easier. Latex provides a bouncier feel than a foam mattress, so is best suited to people who prefer an ‘on the bed’ sensation than the contouring feel memory foam can provide. The Latex Hybrid also has a firmer feel than the foam mattresses, so those who prefer a firm surface with less give will probably like this bed. Another benefit to the Latex Hybrid is that the reduced body conformance means you’re less likely to overheat on this mattress, while the aerated latex layer provides excellent airflow for a far cooler sleep surface. This makes it a good pick for those who sleep hot. The Latex Hybrid model provides the option to have it as Firm on both sides, Medium on both sides, or as Firm on one side and Medium on the other, providing a more versatile option if your sleeping preferences tend to change. The Firm option is rated as an 8-8.5, and is best suited for back and stomach sleepers as well as plus-size sleepers, while the Medium option is rated as a 6.5-7.5 and is most suitable for combination sleepers. The IDLE 14″ Double-sided All Foam mattress is described as offering the best pressure relief and motion isolation out of all four models the brand offers. For those that don’t want too much bounce in their mattress and prefer a high level of support and minimum disturbance when sharing with a partner, the All Foam mattress may present the best option. This mattress is constructed from five layers of memory foam, wrapped with a Thermocool™ fabric cover designed to keep you cool when you feel hot and warm when you’re feeling too cold. Gel Swirl Buoyancy Foam is IDLE’s custom blend of memory foam, which they claim is responsible for providing up to four times more pressure relief than other memory foam with a quick response time that makes it easy to adjust positions throughout the night. In addition, the gel prevents the foam from trapping heat, providing a cooler sleeping environment with better airflow. The High-Density Foam Core provides support to the mattress and also minimizes motion transfer better than the pocketed coil models. If you are a light sleeper and tend to find your sleep disturbed by your partner’s movements throughout the night, the All Foam IDLE mattress might be the best option to go for. This mattress is also available in Medium and Luxury Firm, with the Medium option rated as a 6-7 on the firmness scale and best suited to combination sleepers. The Luxury Firm is rated as a 9-9.5 on the firmness scale and provides a more solid surface for back and stomach sleepers, or heavier sleepers who want less give in their mattress. The IDLE 12-inch Double-sided Dual Firmness mattress is an all-foam mattress that provides a Medium firmness level on one side, and a Luxury Firm side on the other, to provide two different firmness options if you’re not sure what will suit your preferences best. This mattress provides many of the same benefits as the All Foam model, with Cooling Buoyancy Foam layers to provide up to four times more pressure relief than most memory foam mattresses and two layers of Support Foam for deep body support, bounce, and improved air circulation. The Dual Feel design is IDLE’s most affordable option and is designed for people who aren’t sure what firmness to select when buying a mattress online. This option is also useful because sleep preferences can change over time. You may enjoy a slightly softer mattress now, but in several years time you may want a firmer surface and the Dual Feel provides that versatility without needing to replace your mattress. The Medium side of the Dual Feel mattress is rated as a 5.5-6 on the firmness scale, providing the softest option in the entire IDLE range, while the Firm sided is rated as a 7-7.5 out of 10. Sleepers who prefer a very firm surface may still find this side too soft for them. The Medium firmness model is the most popular option, providing a good balance between comfort and support. It is described as suitable for combination sleepers, so is a good option if you tend to switch between sleeping on your back, stomach, and side throughout the night. The Luxury Firm option, in contrast, is best suited to people who know they prefer a firm mattress. It is most suitable for back or stomach sleepers but is also a good option for plus-size people who may find softer models cause too much sinkage throughout the night. IDLE Mattress is highly rated for how well it isolates motion in both the pocketed coil and foam models. The Pocketed Springs feature Edge-to-Edge support, giving you and your partner full use of the bed to minimise any disturbances when you’re both moving around. What’s more, the foam models have a high-density Foam Core, which IDLE claims provides the best motion isolation for undisturbed sleep, no matter how much your partner moves around beside you. 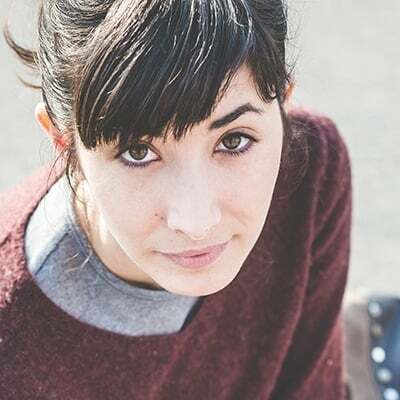 One of IDLE’s biggest selling points is the two-sided nature of the mattresses. Designed to be identical on both sides (unless, of course, you’ve opted for the Dual Feel option), you can simply flip your mattress to limit body impressions and sagging from the foam inside breaking down with use. This design is meant to maximise the lifespan of your mattress, ensuring it feels new for longer without the need to replace your mattress for years. All four mattresses are available in sizes ranging from Twin to Cal King, and measure 14-inches in height, except for the Dual Feel option, which is 12-inches high. IDLE mattresses are thicker than competitor mattresses (or at least the same thickness), due to the fact that they are designed for use on both sides. That the IDLE mattresses have twice as much foam and other materials in them but stay at the same price point as similar mattresses is a big bonus to be considered when shopping. Another big selling point for the IDLE mattresses is their cooling properties. The Hybrid, All Foam, and All Foam Dual Feel mattresses are all wrapped with a Thermocool™ fabric cover. The fabric is designed to work with your body’s natural thermal capabilities, using smart fibre cross-sections to create a cool sleeping environment to prevent you from overheating, while also keeping you warm when you’re cold. In addition, IDLE use a custom blend foam that they call Cooling Buoyancy Foam to provide a cooler alternative to memory foam. This foam is made with no viscoelastic chemicals, which they claim can trap and store heat within a mattress. Without these chemicals, heat can dissipate through the mattress easier for a cooler sleep surface all night. IDLE mattresses will have a ‘new mattress’ smell for the first couple of days after unpacking, but the brand claim this off-gassing is minimal and will dissipate within 24-48 hours. Another great feature of the IDLE mattress range is that all mattresses come with a 120-night sleep trial period, allowing you to fully test the mattress and decide if it’s right for you before committing. What’s more, all IDLE Sleep mattresses include a lifetime warranty, so you know you’re buying from a company that stands behind the quality of their mattresses. 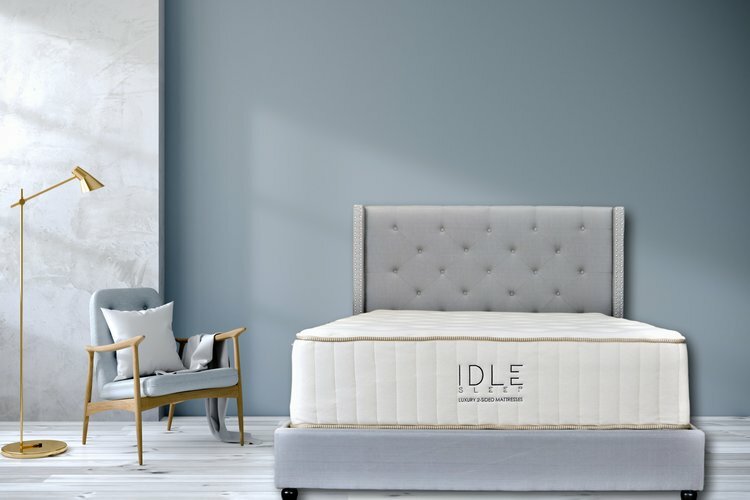 The IDLE Latex Hybrid Mattress is constructed using organic cotton and natural Talalay latex, making it the most eco-friendly option in the range and a great option for eco-conscious people. Additionally, the latex is naturally hypoallergenic and cotton provides a very breathable surface, so the Latex Hybrid is a good option for allergy sufferers. IDLE also uses CertiPUR-US certified foams, which means they’re free from ozone depleters, PBDEs, TDCPP, or TCEP flame retardants, mercury, formaldehyde, phthalates, and they have low VOC emissions for better indoor air quality. Considering the quality of the materials used, combined with the premium two-sided construction, the IDLE mattresses are very reasonably priced. Starting at $1,299 for the Queen-size Dual Feel mattress and $1,499 for the Queen-size Hybrid mattress, these mattresses aren’t exactly at the budget end of the market, but they aren’t the highest priced beds either. They do offer good value for money when you take into account their quality plus the sleep trial and lifetime warranty that comes with your purchase. Q: What type of surface should I place my IDLE mattress on? A: All IDLE mattresses can be placed directly on the floor, used with a platform bed frame, box spring, foundation, slats, or an adjustable base. IDLE also sell their own adjustable base, platform base, and smart base, which you can view here. Q: How is the IDLE Mattress shipped? A: The IDLE Mattress is a convenient bed-in-a-box, delivered to your door roll packed and boxed. You simply need to move it into the place you want your mattress, pull on the loose end of the plastic and unroll the mattress. It should expand quickly and be ready to use shortly after unpacking. Q: How should I care for my IDLE Mattress? A: IDLE recommends you rotate your mattress every few months and to flip the mattress between two and three times a year to increase its longevity and get the most use out of it. If you and your partner are of different weight, IDLE recommends rotating and flipping the mattress more frequently for even weight distribution and wear. 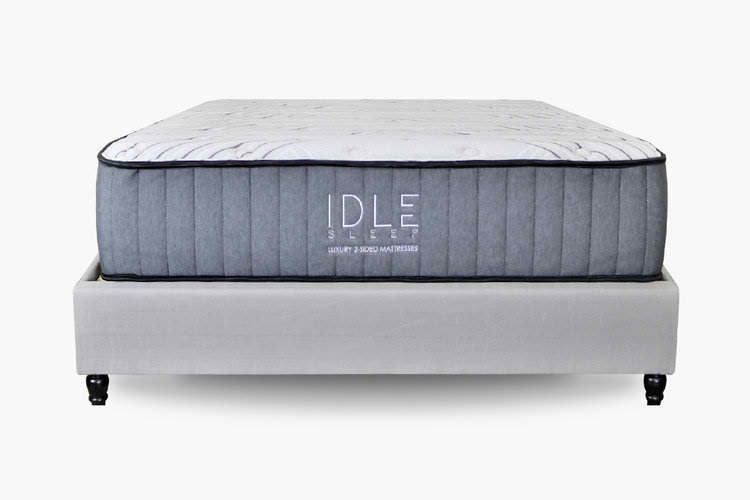 IDLE Sleep receives excellent reviews for their range of mattresses and for good reason. The brand seems to have taken every key feature that makes a great mattress into account, from cooling and pressure relief to the innovative two-sided construction that promises a longer lifespan for your mattress. The IDLE Sleep mattresses are extremely reasonably priced for the quality of materials they offer and the sleep trial period and warranty that comes with every purchase makes this mattress brand a standout option for your bedroom and great value for money.